Honda Cars launched the new Amaze at the start of the year. 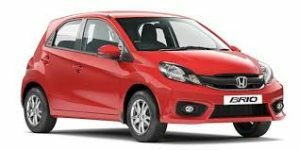 The second we set eyes on it, we knew that the new Honda Brio would be just around the corner as well, the company just kept mum about it. Well, we were right and here it is, the new Brio, ladies and gentlemen. The Honda Brio was showcased as a futuristic concept in the previous, 10th edition of the Auto Expo held in Delhi last year. Of course, the final production version of the Brio doesn’t quite have all the sci-fi features that the concept featured, but it has carried forward much of the design concept. The Brio’s design is classically Honda. Starting from the shape of the headlamps to the aerodynamic profile, to the broad bonnet grille with the H logo in the middle and the character lines, the Brio’s design features can all be traced back to other Honda hatches. Yet, the Brio is distinctive and very unique in the brand’s line up. A number of simple, relatively straight lines that are meant to enhance the perception of length and width of the Brio have been integrated. There is also a lot of clarity and purpose with merging lines that give the Brio’s design a lot of sophistication – like the front bumper lip that seems to merge into the shoulder line and the aerodynamic profiling for the door mirrors that merge with the base of the windscreen. The plastic quality of interiors might not be what you expect of a Honda. Clearly, the company has done some cost cutting and it shows. There are some flimsy plastics, which scratch and come off quite easily. However, the overall quality is at par, if not less, than the competition. Although there is enough room to seat five adults in the car, where the car lacks in is the boot space and is a big disappointment. Honda’s engineers have utilized the interior space in a way that maximum space is provided to the occupants while the boot has been relatively ignored, which isn’t big enough to store anything more than your groceries and vegetables. That said, the car feels airy and fresh, thanks to the large glass areas and the light beige plastics inside. The Honda Brio gets features such as power windows, steering-mounted audio controls, bluetooth and aux-in connectivity, defogger, electric mirrors, cup holders, etc. The car also gets projector halogen headlamps and push button keyless start. The Brio does miss out on the climate control, which could’ve given the car a more luxurious appeal. A dead pedal is sorely missed too, which is a clear oversight on Honda’s part. So when you look into the business end of the Brio, you find the familiar 1.2-litre i-VTEC mill that you find in the Jazz as well. Thankfully, Honda hasn’t decided to do something drastic such as downsize the engine for this smaller car, or something as dire as lopping off a cylinder to achieve that. What Honda has done is smartly retune the motor in keeping with the ‘city car’ aspect of the Brio. The 1198cc motor now produces 88PS of power which comes at 6,000rpm and a decent torque of 109Nm, available at 4,600rpm. The five-speed manual gearbox which sends that power and torque to the front wheels features revised ratios as well, which are very well suited to capitalise the new state of tune of the engine. What really works in favour of the engine is its unimaginable levels of refinement it offers. During our test drive, we were tempted to turn the key again to bring it to life when we though the engine was switched off, when it was already running, turning away at idle rpm. With a state of tune that favours city driving over spirited, corner carving shenanigans, one would expect the performance to be rather on the low side. But this couldn’t be further from the truth. The dash to 100km/h from standstill is completed in just 14.36 seconds – the second quickest we’ve tested for any 1.2-litre hatchback so far, just a couple of tenths more than the Hyundai i10 Kappa. While the acceleration from zero certainly is impressive, the in-gear roll-on is quite strong as well. Put your foot down at 60km/h in fifth gear, and the 100km/h mark comes up in just 21.33 seconds. In fact, try the same from as low as 40km/h, and still the Brio doesn’t bog down at all – something that even more powerful cars available in the market struggle with. The only place where the Brio’s engine shows its lower state of tune is in its top speed. With the torque dropping off sharply after its peak at 4,600rpm, the Brio runs out of steam after 142km/h when going for a top speed run. While it eventually will hit the company claimed 150km/h mark, it would need a really long straight, and maybe a bit of a slope to do so. But top speed figures are not what really determine a car’s worth. When it comes to driveability, the Brio scores high marks, be it in bumper-to-bumper city traffic, or even cruising at highway speeds. The Honda Brio is underpinned by a very potent platform in terms of dynamics. This is why currently Honda has four products based on the same platform including two 7-seaters. The Brio can handle triple digit speeds with good stability on the highways. The ride quality is flat most of the times and it doesn’t unsettle on bad roads. Since it is a light hatchback, the handling is brisk and the Honda Brio feels eager to take corners hard. The steering feels direct and very predictable while cornering. Braking performance is quite effective too having a strong pedal bite. There are no mechanical changes so you won’t feel any difference compared to the pre-facelift model. CThe braking performance of the Brio is decent and on par with its rivals. The top version comes with ABS, further helping in the braking performance. The 175 mm-wide tyres also provide for a decent braking performance. The front wheels have got ventilated disc brakes while the rear ones have drum brakes. The brakes do a good job in stopping this sprightly little hatch, thanks to the lightness of the car. The car has passive safety tech such as ABS (Anti-lock Braking System). The ABS system helps in case of sudden braking situations, and prevents the car from skidding and going out of control. It wouldn’t need much of a stretch of imagination to call what Honda has on its hands a ‘perfect city car’. The Brio really hits all the essential nails perfectly in the head, be it convenience, comfort, driving pleasure and more importantly, the right price point. Coupled with the excellent reputation that Honda enjoys in India, the deal almost seems too sweet to be true. Even in this era where every car maker has a highly competitive product in this segment, you will be really hard pressed to find another hatchback that offers so many features, such great quality, absolutely premium feel and a brag-worthy badge on the front grille in one delectable package.